Body By Nature have designed the tablets to be small so they are easy to swallow.This multi-vitamin has a high level of B vitamins - B1, B2, B6 and B12 plus other important vitamins and minerals makes this a great product for children and the Elderly. These supplements are made from plants NOT synthetic chemicals like other brands. For ease of use we combine a pro-biotic to help. Yeast free and suitable for vegetarians and for people with Candida and Yeast sensitivities Free from genetically Modified Substances. This particular supplement is combined in a base of friendly pro-biotic species called lactobacillus bulgaricus which is a native inhabitant of the human tract. Children aged from 4-12 years = 1 tablet daily. Teenagers and lightweight adults = 1 tablet per 20kg of bodyweight daily,or take as directed by a practitioner. Inactive Lactobacillus bulgaricus combined with pantothenic acid, niacin, para amino benzoic acid, zinc citrate, vitamin B6, thiamin, riboflavin, ferrous fumerate, copper sulphate, potassium iodide, chromium III chloride, vitamin D3 and vitamin B12; vitamin C incorporated in citrus pulp; vitamin E combined in vegetable oil; beta carotene combined in carrot concentrate; vegetable stearic acid; folic acid and vitamin K combined in alfalfa concentrate; mineral enhanced yeast providing selenium, biotin combined in corn meal concentrate; tablet coating (hydroxypropylmethylcellulose). 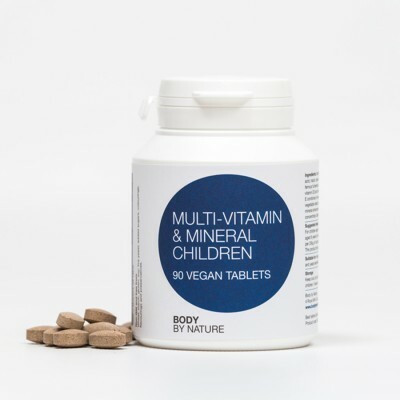 For children aged 4 to 6 years – 1 tablet daily; For children aged 6 years & over and adults should take at a level of 1 tablet per 20kg of bodyweight, or as directed by a practitioner. This product should not be used as a substitute for a varied diet. *RDA = Recommended Daily Allowance. egetarians and for people with Candida and yeast sensitivities. Wheat; starch, gluten; soy; live yeast; added sugars, colourings, flavourings and preservatives.